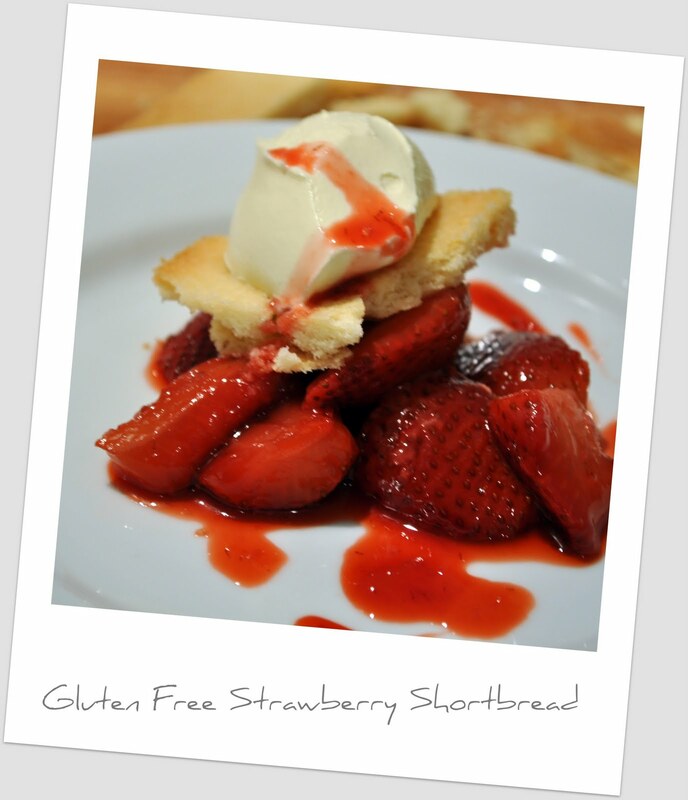 Gluten Free Shortbread - WARNING: Crumbly, Creamy, Addictive!! Wow, I am in love with this recipe! It has to be possibly the best thing I've ever made - gluten free. I say that every time, don't I? 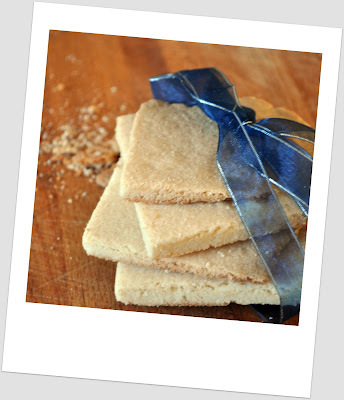 ;-) But no, REALLY, this shortbread is AMAZING! And it lasts a long time (if you are strong enough not to give into temptation ;)) Generally, baked goods made using gluten free flour, go stale after a day or two, but this shortbread can last up to a week or even longer if sealed in an airtight container. Doesn't it just make the most adorable gift too? 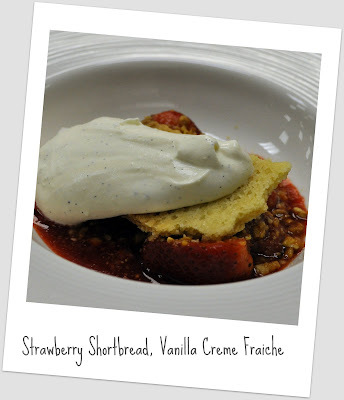 At last week's Neill Anthony Masterclass, he made a dessert of Strawberry Shortbread with Vanilla Creme Fraiche, which was insanely yummy. I couldn't wait to attempt my own gluten free version! I discussed baking gluten free a few weeks ago, over here, where I mentioned the ratios of the different flours: Heavy, Medium and Light. For biscuits the ratio is generally 1 Medium; 1/2 Heavy; 1 Light. The almond flour adds a lovely nutty flavour and texture. 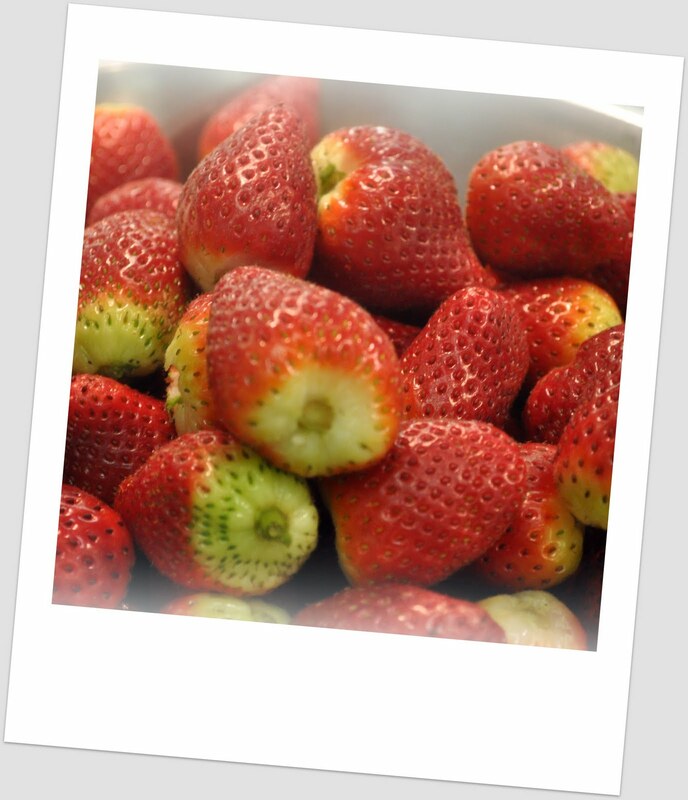 Slice strawberries in half, depending on the size, sprinkle with a little caster sugar or fructose and add to a hot pan. Cook until strawberries have softened. Construct dessert by placing strawberries at the bottom, a piece of shortbread on top and then finish off with a dollop of creme fraiche, speckled with vanilla seeds. Simple, yet so effective and delicious! The feel is of a casual dinner party - the guests being a collection of amazing personalities, all with a story to tell. If I don't know them at the beginning, I always feel that by the end, I have made a friend. And Thursday, 8th September's, Masterclass was no exception! The demonstrations are another highlight. I enjoy the relaxed way that Neill guides us through his menu and thought processes and encourages us to get hands on while he shows us how to make each course. His passion for food is evident in each action and statement. 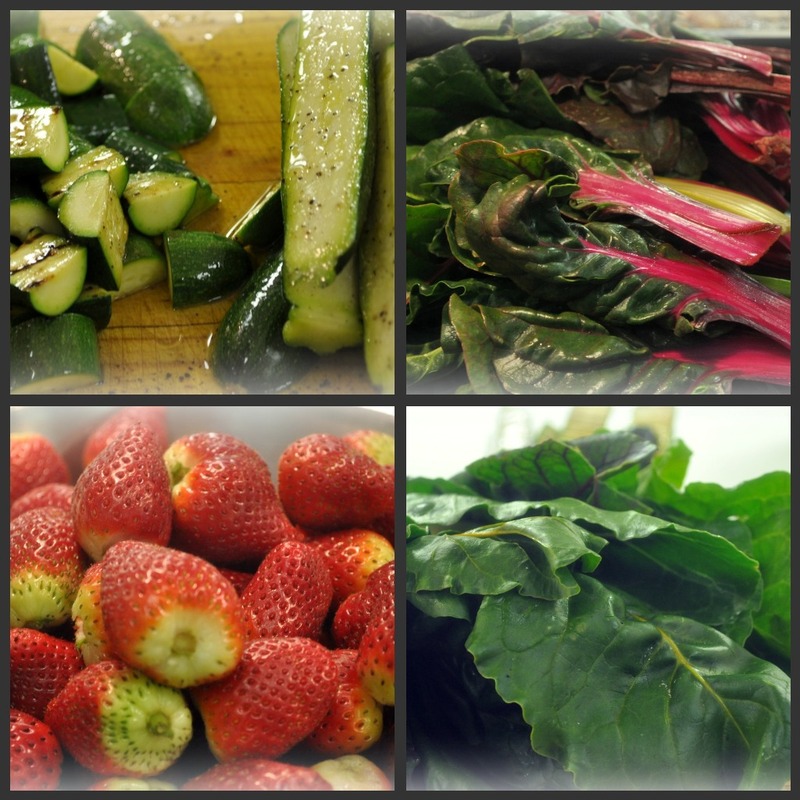 Neill's ethos is to use only locally produced, seasonal and ethical ingredients. Therefore, you know that what you are eating is of the highest quality. For starters we had Grilled Courgette Soup with Aubergine Tortellini. Char-grilling the courgettes adds another dimension to these otherwise fairly bland veggies and by blending in a high speed blender, the soup becomes creamy, eliminating the need to add too much cream. I never realised how much effort went into making pasta; for the kneading alone you need to be strong, really strong! And you have to be quick and not over-knead because if it cracks, it's ruined. This Masterclass was a rather special one as we were privileged to be the first members of public to see and taste Mad Hatters' wine. The name is symbolic of the various hats we wear on a daily basis, be it at work, home or while socialising. Each wine is based on a different region of the world, and is designed to educate South Africans on interesting cultivars. The wine that was paired with the soup was called Roussane Grenache Blanc, which is a French-style light wine. It has a buttery feeling that complimented the creaminess of the soup. The palate is soft citrus and the nose is reminiscent of flowers. The French saying "Joie de Vivre" or Joy of Life captures the essence. My thoughts on the first dish: The wine, a little crisp to begin with, became instantly smooth when in contact with the soup. 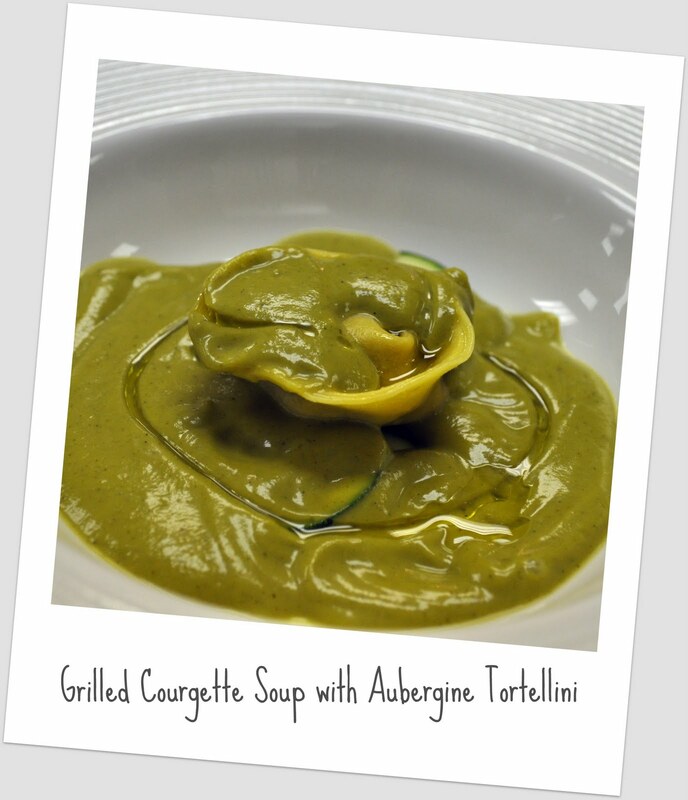 The soup on its own was subtly delicious, but a triumph when combined with the smoky, earthy and zesty flavours of the aubergine tortellini. 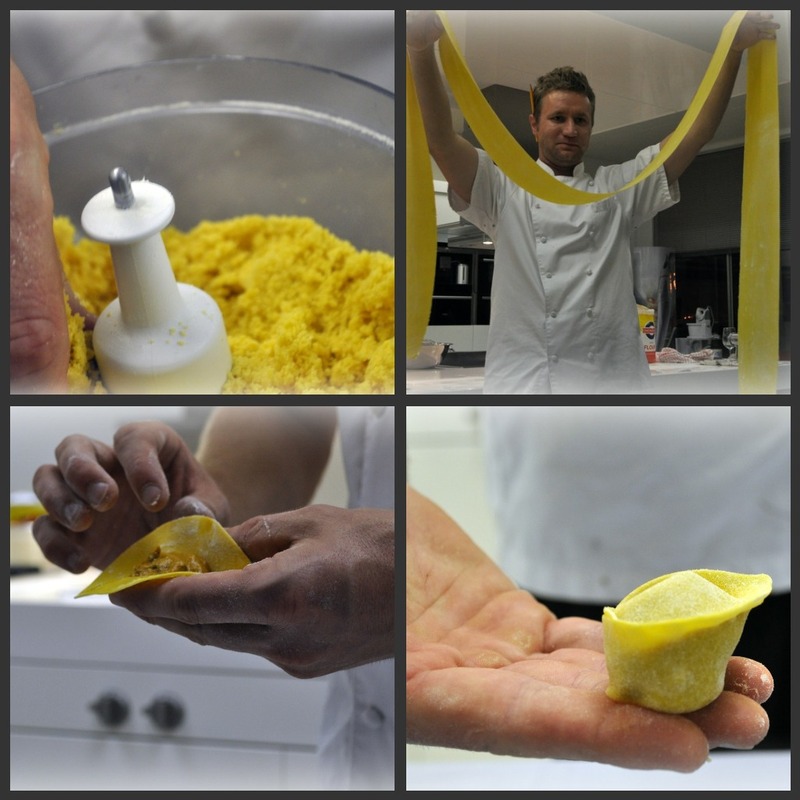 Matt Manning is the Sous Chef at La Colombe, which has been rated as one of the top 10 restaurants in South Africa. 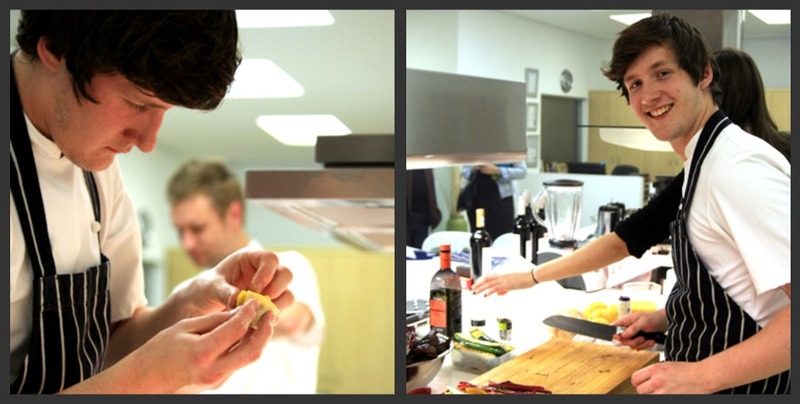 He is Neill's right hand man during these Masterclasses and is doing unbelievably well for himself at such a young age. Together these three men make an unstoppable team! 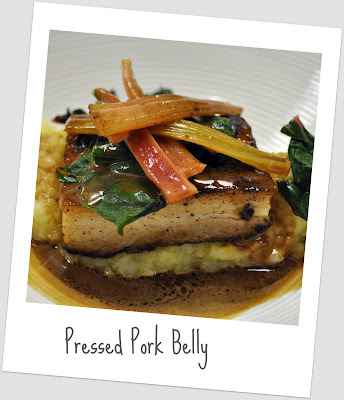 The main course was Pressed Pork Belly with Olive Oil, Lemon Potato Puree and Seasonal Greens. The pork belly is cooked slowly to produce the best result. It is firstly placed in a 10% salt brine over night to draw out all the excess water, which is then rinsed off. The pork belly is then pressed and rubbed with NoMU Coffee Rub and cinnamon and roasted for 8.5 hours. The crackling, for me, was most certainly the highlight as it conjured up memories from my childhood. It is amazing how food has the power to do that! The crackling is also cooked very slowly over a period of 6 hours and the oil continuously drained off so that what is left is just the crispy, delightfully salty skin. This course was paired with Mourvedre, which is a full bodied wine of Spanish descent. The wine evokes the grace and power the Spaniards exhibit while dancing the Flamenco. My thoughts on the main course: The tenderness of the pork although in direct contrast to the zingy mash, made a surprisingly joyous pairing, while the richness of the gravy rounded off the dish. The lemon cut through the slight harshness of the wine (due to it only having been in the bottle for 3 weeks), whose gingery and peppery notes, brought out the coffee flavours of the pork. The end result was harmony on the tongue. "If ever I'm on death row, I want Neill to make this gravy for me!" Exclaimed Dawn Jorgensen after her first taste. An impressive compliment, wouldn't you say? The final course was Strawberry Shortbread with Vanilla Creme Fraiche. Resting the pastry once it has been rolled is imperative. Due to its high butter content, the pastry will split if this step is not followed. 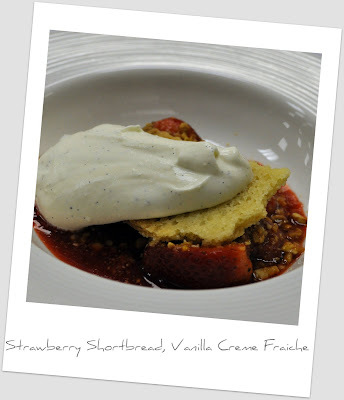 Macerated strawberries (softened or broken into pieces using a liquid), creme fraiche, speckled with seeds from a vanilla pod and an extra special sprinkling of salted peanut brittle made up the remainder of the dessert. This dish was paired with Bovlei Gewurztraminer. An off dry wine with litchi flavours. My thoughts on dessert: When combined, each component of the dish united magically - the salted peanut brittle tied the whole dish together, resulting in a marriage made in heaven. The wine, an atypical dessert wine, although delicious on its own, in my mind, needed to be slightly sweeter to break through the tartness of the strawberries. Jokes fly, wine flows, cutlery clinks and laughter rings out as food is devoured by friends, new and old. For more information Contact Neill Anthony on info@neillanthony.com or 072 584 7851 or on twitter @neillanthony. It was an icy day in Paris; the streets were glistening and I was huddled into my giant hooded jacket. The wheels of the bus were crackling on the wet tar as we sat at the top of an Open Tour bus, gazing at the many beautiful sites, while our breath turned into chilly smoke (can you say tourist?). Suddenly, the skies opened, showering us with sleet and other gifts from nature. Freezing, and looking a little like drowned rats, we jumped off at the nearest stop, which happened to be close to the Eiffel Tower, and raced into the closest cafe - teeth chattering. I needed warmth and comfort and I needed it NOW! 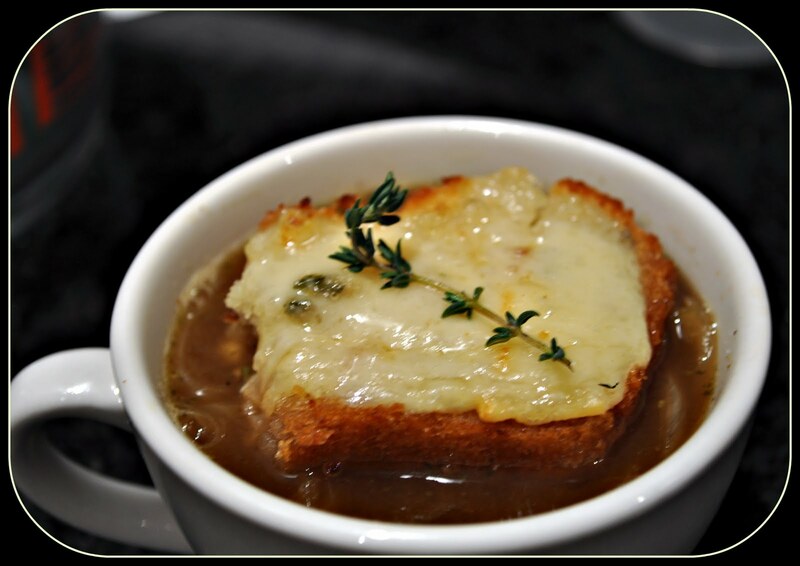 While briefly checking the menu, my eyes rested on French Onion Soup and I thought, "Hey, when in Paris..."
As my soup arrived, I spied the floating islands of cheesy toasted bliss above a sea of brown and smiled. Yes, I was happy to see those cheesy croutons as I wasn't expecting them, but I couldn't eat them all the time - in order to make an "authentic" French Onion Soup, I decided to make my own. Grind the Provençal Rub in a pestle & mortar or spice grinder. Halve the onions and slice each half into thin slices. 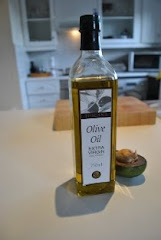 Melt the butter in a heavy based saucepan and add the onions, garlic, a pinch of salt and Provençal Rub. Sweat the onions until translucent, stirring quite regularly. Once the alcohol has evaporated, turn down the heat to low, cover the onions with greaseproof paper and continue to cook very gently until all the natural sugars in the onion have caramelized and the onions are soft and sticky. This can take 30-60 minutes. Bring the soup up to a boil and skim off any froth and oil that rises to the surface. Return the heat to a slow simmer and cook for another 45 minutes. At the end of cooking, season the soup with salt and black pepper. 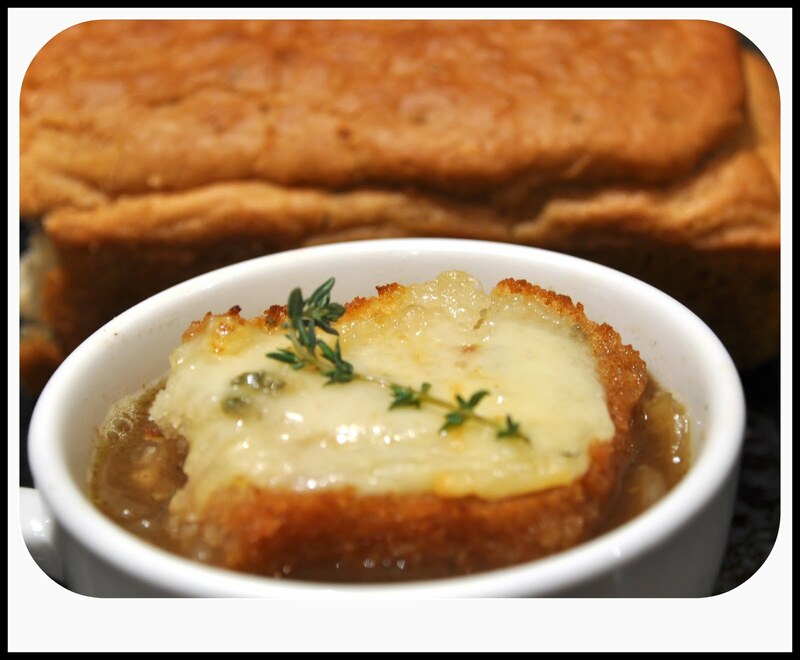 When ready to serve the soup, toast the baguette slices on one side under the grill in the oven. Turn around and cover the other side with Gruyere. Grill until the cheese is golden and bubbling. Serve the soup in warm bowls topped with the Gruyere croutons. Serve at least 3 croutons per person. Before Attempting this beer bread - please read the below - if you have Coeliac Disease I would recommend that you do not make it, although there seem to be very contradictory views on the subject. According to Vital, "Windhoek Light and Bavarian Brau are apparently made using the German method of distillation which is supposed to eliminate the gluten from the fermented grains." Budweiser also claims to be gluten free. From Wikipedia, "Some brewers feel that beers brewed mainly from cereals such as rice, sorghum, buckwheat and corn (which either contain no gluten or contain glutens that do not trigger an autoimmune response in coeliacs), and including a proportion of barley or rye, are safe to drink. These brewers argue that the proteins from barley are converted into non-harmful amino acids. Statements from brewers show that their scientists feel confident that their product is non-harmful to those who are gluten intolerant. However, there is some concern and evidence that the claim is not true. Although the barley hordeins in such tests may not be detected, smaller pieces of these proteins, known as peptides, may remain and be toxic for coeliacs. 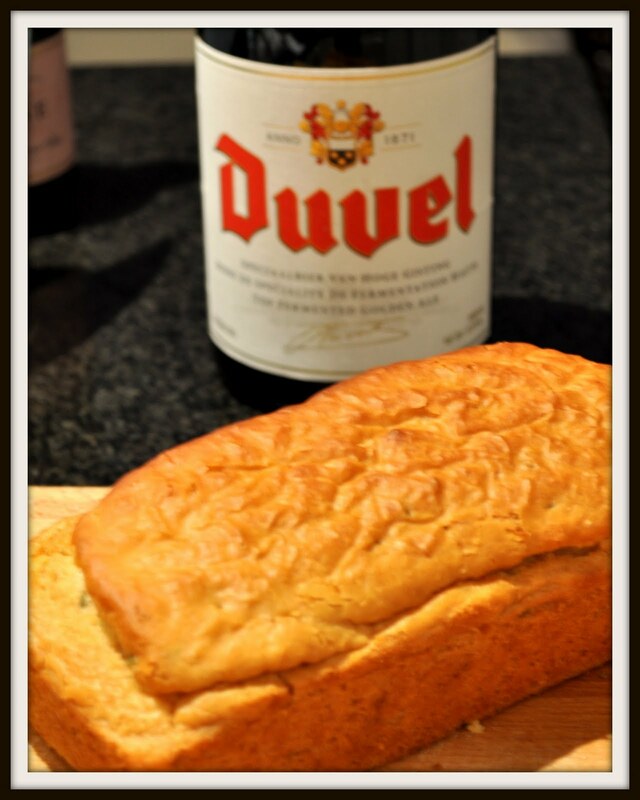 However, while it is likely that most coeliacs will be able to drink beer with less than 20ppm such as Budweiser or beer made with rye malt (in moderation) without causing themselves any harm, it is likely that each person has a different level at which an autoimmune response will be activated and there is some debate over the gluten "level" acceptable to coeliacs. There are brewery statements that "normal beverages" such as Budweiser are safe, tempered with advice that they should be drunk with caution." 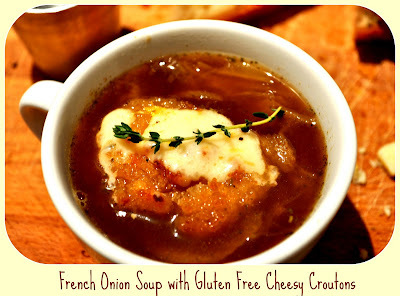 This recipe is modified from the amazing Ishay's blog - Food and the Fabulous. I wanted a simple recipe and this one seemed to tick all the boxes.